If your cat's coat is looking dull and dingy and she's losing hair, it's a good idea to learn about the symptoms of ringworm in cats. Know how to spot this infection and effectively treat it can help improve your cat's quality of life - and her appearance. Just the very word "ringworm" can throw some people into a panic, but most don't actually understand what this organism is. Although some people believe it's a worm, similar to the other worms that pets and people can be susceptible to, ringworm is actually the common name for a group of fungal species. Of this group, Microsporum canis is the most common cause of a ringworm infection in pets and people, and yes, the infection is equally transferable between dogs, cats and humans. So, the next question is how do we contract a ringworm infection? Ringworm seems to prefer hot, humid climates, but since it can last in the environment for 18 months, it's possible to contract the fungus nearly any time of year. Most ringworm infections are the result of direct contact with a person or animal that harbors the infection, however, ringworm spores can be shed anywhere in the environment so they're easy to pick up. Thank goodness a strong immune system is enough to ward off a full blown infection in many cases. Ringworm in cats is most typically contracted through cat-to-cat contact, but it can also be picked up from shared grooming equipment and living quarters. Cats already suffering from feline leukemia or AIDS virus are at increased risk for the fungus. A cat suffering from a ringworm infection is a sad sight indeed. The animal is plagued with sporadic lesions of circular hair loss, and these lesions tend to look slightly irritated and scaly. Sometimes the center of the "ring" contains a pustule, and the animal may appear greasy as well. Most ringworm lesions are initially found around a cat's head and tail region, but a prolonged infection can result in lesions all over the animal's body. It's also possible for the fungus to make its way down into a cat's ear canals, leading to chronic ear infections. A microscopic examination of hairs plucked from the edge of the ring typically reveals the fungus imbedded in the shafts. A sample from one of the crusty lesions can be cultured to reveal fungal growth. In some cases, a less advanced ringworm infection can be treated by shaving the hair from the affected areas and applying an antifungal cream such as Miconazole. In long-haired cat breeds, most vets recommend completely shaving the cat to eradicate the fungus in the hair shafts and reveal hidden lesions that can then be treated.Sometimes oral antifungal medication such as Ketoconazole is also used to cure a ringworm infection, but this treatment is usually reserved for more severe infections because the drugs used carry a risk of toxicity. Avoiding a case of ringworm is certainly easier than treating one, and there are protective measures you can take to reduce the chances you and your pet will become infected. Keep your cat indoors away from other stray cats and dogs. Keep your environment, and especially your cat's bedding, very clean. 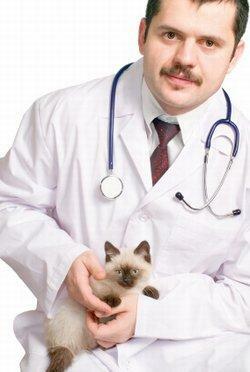 Before bringing home an adopted cat or kitten, have your vet culture the animal for ringworm. If purchasing a pet from a commercial cattery, try to visit a closed cattery that doesn't allow other pets into the building. Ringworm is not a death sentence, but it can become a chronic problem that severely dampens the quality of your cat's life. As you give your cat her weekly brushing, take a moment to look through her fur for the earliest sign of skin lesions. If you find anything that looks suspicious, get in touch with your vet right away.